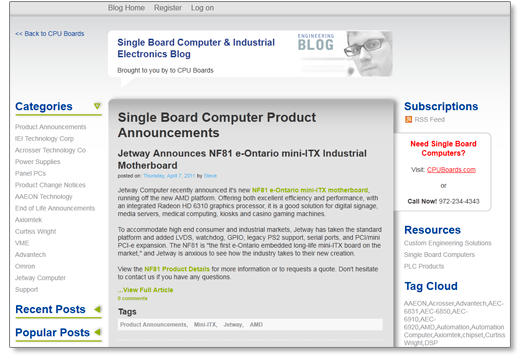 Because our goal is to provide as much useful industry information to our customers as possible, we have launched the CPUBoards.com Industry News and Product Announcements Blog. The blog is dedicated to product announcements, press releases, manufacturer news, end of life (EOL) and product change notices (PCN), interesting troubleshooting situations, and just about anything else we think is valuable industry information. You can subscribe to the blog's RSS feed to keep up to date when fresh content is published, or you can simply check back on a regular basis. We try to keep as much new information flowing as possible. We encourage you to comment on articles you find interesting and let us know what you think, and if you have any suggestions for the blog itself, feel free to contact us and let us know!